1923　Matsuyama Koto Shogyo Gakko (Matsuyama Higher School of Commerce)is established. 1944　Renamed Matsuyama Keizai Senmon Gakko (Matsuyama College of Economics). 1949　In conjunction with the Educational System Reform, the school obtains university status. Faculty of Commerce and conomics is established. 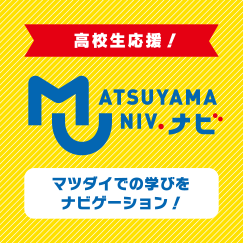 1952　Matsuyama University of Commerce establishes a Junior College. Economics and the Faculty of Business Administration is established. 1972　A Master’s degree course in Economics (Graduate school) is established. 1974　The Faculty of Humanities (English Department, Sociology Department) is established. A Doctoral degree course in Economics (Graduate school) is established. 1979　A Master’s degree course in Business Administration (Graduate school) is established. 1981　A Doctoral degree course in Business Administration (Graduate school) is established. 1988　The Faculty of Law is established. courses in Sociology (Graduate schools) is established. 2007　A Master’s degree course in Language Communication (Graduate school) is established. 2014　A Doctoral degree course in Clinical Pharmacy (Graduate school) is established. Present　Over 90 years have passed since the foundation.75,000 students have graduated.